Hello. It seems that one consequence of the lingering ammunition shortage is trying brands we've not used before and so it was for me with respect to two different .38 Special loads I fired today through a 4" S&W Model 10 HB. 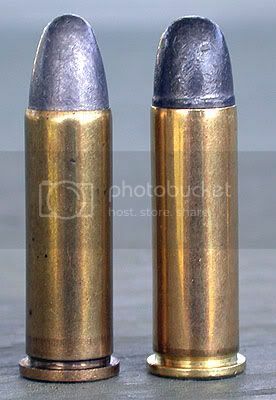 Both loads were described as being standard-pressure, non-corrosive, boxer-primed and loaded with 158-gr. LRN bullets. These were from Lapua (Finland) and Prvi Partizan (Serbia). 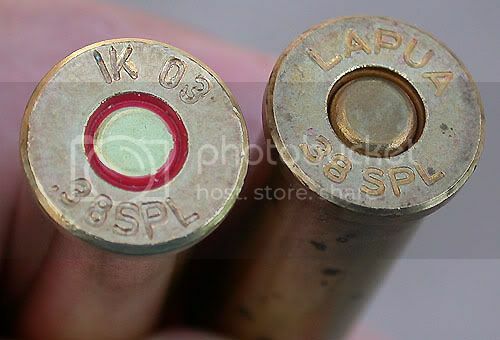 Both of these rounds had brass cases and had LRN bullets but the Lapua (left) was noticeably more pointed than the Serbian ammunition. It was not easy to see, but I think that the Lapua cartridges had sealed primers. The bright red sealant on the Prvi Partizan leaves no doubt that it is. The Serbian ammunition was packaged in 50-round cardboard boxes. Finish on some of the Lapua ammo was considerably more tarnished than the Prvi Partizan and I think it may be quite a bit older. 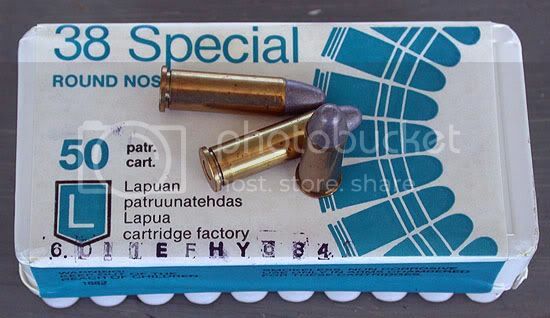 The Lapua was bought in a sealed metal tin containing 700 rounds or 14 fifty-round plastic boxes. The Prvi Partizan came with every 5 boxes sealed in plastic. I have no idea if that was from the manufacturer or distributer. Both loads shot essentially to the sights of my Model 10-6 Heavy Barrel revolver and both seem to group satisfactorily to me, at least in this initial range session. I shot at 12 yards because to get to the 15-yard backstop and staple targets, I'd have to stand in about 3" of water. I attached my targets to the 10-yard backstop and took two "long" steps back from the table for the estimated 12-yard distance. Today's shooting was done standing and in slow double-action-only using a two-hand hold. There were no malfunctions with either load. Initially, it does appear that either will be fine for informal target shooting but I have not tried either of these loads before or at any distances greater than today's distance. I do not remember where I bought the Prvi Partizan. It was a good while back and I've slept since then. I think I paid $11 or $12 per box but just don't remember. If it can be found "right", it does appear to be good range fodder from my admittedly limited preliminary shooting session. I believe that either load would serve well. Prvi Partizan (Serbia) is also the manufacture of Academy's store brand ammo (Monarch) . 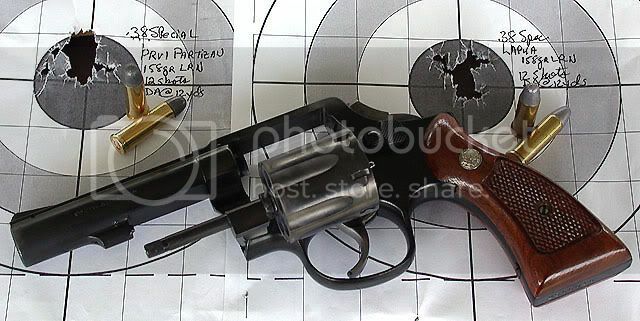 I have shot their 38 Sp in my snub Rossi without any problems and it shoots well. The price is right and it is good range ammo. GaryAdrian wrote: Prvi Partizan (Serbia) is also the manufacture of Academy's store brand ammo (Monarch) . I've shot the Monarch ammo in calibers .38 Special, .45 ACP, and 9mm. I wouldn't call it perfect by any means, but it is adequate for practice purposes. It burned no dirtier than WWB. 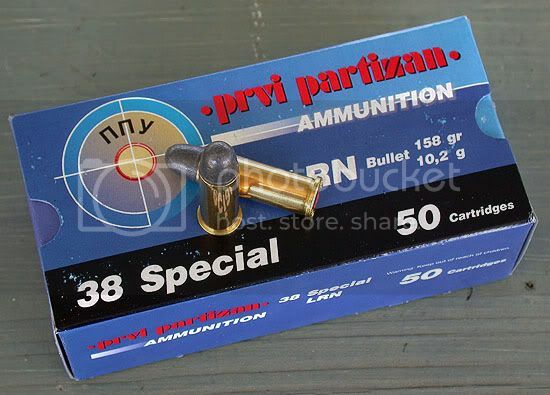 That said, I've sampled the Prvi Partizan .308 "Match" 168 grain HPBT ammo in two different heavy barreled bolt action rifles, and it is not anywhere near worthy of the name "Match." They're calling it that because it has a HPBT bullet that weighs 168 grains, but that is meaningless. Their Match cartridge shoots no better than any other run of the mill mass produced cartridge from other manufacturers; and is certainly not in the same league as 168 grain .308 Match ammo from Federal, Hornady, Black Hills, or other premium manufacturers. For example, my Remington 700 VSF, which will shoot .5" groups at 100 yards using ammo from either of those three premium manufacturers, won't do much better than 1.5"-2.0" groups at the same distance with the Prvi Partizan cartridge. But rifles are not pistols, and the distances they are used at are nowhere near the same, so I would use the Prvi Partizan ammo for practice at pistol distance and be comfortable with it. I have not tried PRVI or Monarch ammo in 38 special but have used the Monarch brand in 243 win. and I found that it shot great.1/2 in.group at 100 yds.I was very suprised by the results but they have stayed the same for several different ammo lots.If the handgun ammo that they make is anywhere neat as good as the rifle ammo that I used it should be more than adaquate for range practice. Did you happen notice on the PRVI Partizan if there was sticky black residue inside the mouth of the case where the bullet seats? I've found this crud in all of my Monarch/PPU brass, and it's quite irritating. It gets the tumbling media stuck to it, necessitating that it be scraped out after tumbling. That Lapua bullet is a bit strange. It almost looks like they loaded it up with 9mm bullets.